Knuckles the Echidna, commonly known simply as Knuckles, is a sixteen-year-old red echidna from the Sonic the Hedgehog series and is the guardian of the Master Emerald on Angel Island. In the Mario & Sonic Olympics crossover installment series, he competes against Mario and others in Olympic style events in which he acts as a Power type character (meaning he excels at games that require brute strength, such as Hammer Throw or Javelin Throw). He is also the fastest of the Power characters. In Mario & Sonic at the Olympic Games, he was voiced by Dan Green, who also voiced Vector the Crocodile in that game. He is currently voiced by Travis Willingham. Knuckles appears as a playable character in Mario & Sonic at the Olympic Games. He is a Power type character and does best at events that require strength. Knuckles reappears in the game's sequel as a Power character again. In the DS version's story mode, Knuckles is found in Frostown, after Mario and Sonic defeats him in a mission, he'll join them and help them in their quest to free the Snow Spirits. Knuckles appears again in Mario & Sonic at the London 2012 Olympic Games. As before, he is playable, and is classified as a Power type character. In the Nintendo 3DS version, he is also part of the "Wild Ones" group of playable characters (alongside Bowser, Donkey Kong, and Vector). 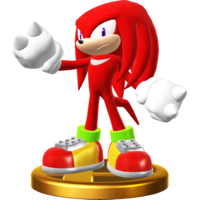 Knuckles is playable once again in Mario & Sonic at the Sochi 2014 Olympic Winter Games, and is yet again classified as a Power type character. Knuckles returns once again in Mario & Sonic at the Rio 2016 Olympic Games. In the Nintendo 3DS version, he is exclusive to Javelin Throw and Boxing in the 3DS version. 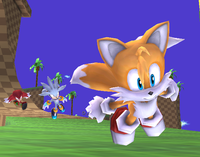 Knuckles also makes a cameo in the Green Hill Zone stage in Super Smash Bros. Brawl, running through the loop in the background along with Miles "Tails" Prower and Silver the Hedgehog. He also has a trophy in the game, as do many other characters from Sonic games. Knuckles does not make much of an impact on the game, however. Knuckles reprises his role from Super Smash Bros. Brawl in Super Smash Bros. for Nintendo 3DS, running in the background of Green Hill Zone, along with Tails and Silver the Hedgehog. A hat based off Knuckles' head appears as a wearable hat for Mii Brawlers in Super Smash Bros. for Nintendo 3DS / Wii U. It has been released on February 3rd, 2016, alongside other Mii Fighter hats, including a Tails hat. Knuckles appears in Super Smash Bros. Ultimate as an Assist Trophy. He attacks nearby players with Homing Attacks just like Sonic, and can also burrow underground and reappear at a different location, attacking with an uppercut. He also appears as a Spirit in Spirits mode. Knuckles reprises his role as a background character in Green Hill Zone. "Knuckles is an echidna that shows exceptional versatility despite his overall strength in Power events. He'll perform best at events like throwing and rowing, but can also provide solid competition in many other competitions that aren't as power-based." SONIC THE HEDGEHOG 3 A powerful red echidna also known by his full name, Knuckles the Echidna. Knuckles resides on Angel Island, where he guards the Master Emerald. 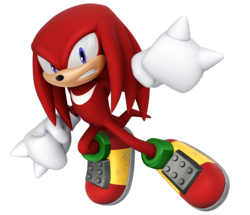 Both friend and rival of Sonic, Knuckles is a martial-arts expert who can break through rocks with his spiked fists. In addition, he can climb walls and use the wind to glide through the air. "Knuckles the Echidna has been friend and foe to Sonic for years. He has protected the Master Emerald on Angel Island, but now has his eye on a new prize: being #1 in the Olympic Winter Games! Powerful and determined, Knuckles will be going for gold with his Screw Driver ability on the Wii and DS, and Spiral Uppercut ability on the DS." Sonic & Knuckles (10/1994) Knuckles the Echidna is the dedicated guardian of the Master Emerald, rarely leaving his post on the floating Angel Island. His serious, one-track-minded approach puts him at odds with his rival, Sonic, but the two somehow manage to be friends all the same. For this subject's image gallery, see Gallery:Knuckles the Echidna. This page was last edited on March 31, 2019, at 22:15.